Want a Haunted Mansion Music Box, a severed finger USB drive, and more? The Resident Evil 7 Collector's Edition has you covered. Almost every game gets a Collector's Edition these days, but some are more impressive than others. 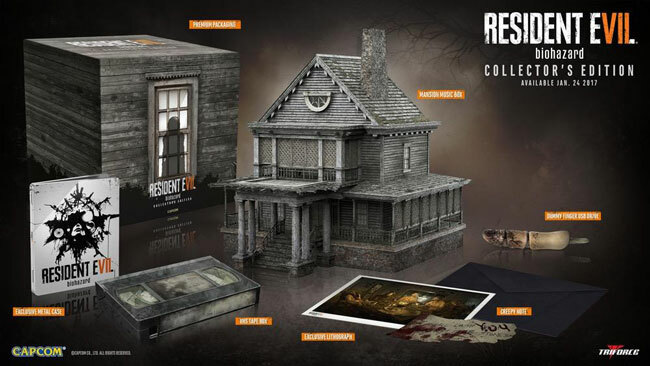 Case in point: the new GameStop-exclusive collector's edition for Resident Evil 7. The biggest inclusion is an eight-inch tall music box fashioned to look like the Baker mansion from the game. It plays a sample of "Aunt Rhody," the game's theme song, with LED lights synced up with the sound. Also included in this bundle is a 4 GB USB drive that's fashioned to look like a severed finger, as well as a lithograph of the Baker family. You can also look forward to getting a VHS tape box designed to hold the aforementioned USB drive. Finally, there's a copy of the game in a collectible metal case. This collector's edition is only available at GameStop, and it remains to be seen if any other retailer-exclusive editions are planned. This one is currently only listed for PS4 and Xbox One, not PC. It's set to release on January 24, 2017.